Before he became a not-so-smooth criminal for his child molestation allegations in the nineties, Michael Jackson was on top of the world. So popular with his music that a movie and a successful arcade game were even made in his shadow. 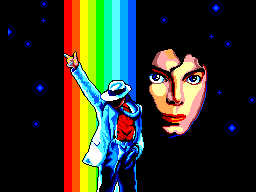 Michael Jackson's Moonwalker was a great arcade game, and in addition to bringing it home to their new Genesis, Sega also made a Master System conversion that would prove to be one of the final games on the system. Is this game a Thriller, or just plain Bad? As misguided as it may seem now, the core of the game has you going into rooms to rescue little kids. The kids are called "Katy's" and yes, you saving them is actually supposed to be a good thing. That's right, Mr. Big and his good squad are out to kidnap all the Katy's in existence (who knew there were that many), and it's up to you to find them all. There are five rounds, and each one has three stages. Basically, you are presented with a sort of doll's house view of a multi-tiered level, and you must kick open doors, grave stones, windows, cars and caves to try to find all the Katy's. Once you find them all, you will progress to a mini boss in order to advance to the next level. In Michael's bid to Heal the World, he also gets a hat upgrade which will let him throw it like a boomerang and unsuspecting enemies. I was hoping his silver glove would factor in as a power-up, but no dice. Michael also has his dance attack as well, but since your magic and life meter are one in the same, using this is pretty pointless, since it just brings you that much closer to death. After all the levels proper are completed, you must then face off with Mr. Big himself in two pseudo-shooter levels. Finish that and you, wait for it...Beat It. Now, how does it play? It must first be noted that the game is interestingly much different depending on the system. The arcade, Genesis and Master System versions are all much different from each other (more on that in the graphics area). Sega did a great job bringing it home on 8-bit though, simplifying the game to comfortably fit in the Master System's lesser shoes. There's no monkey like in the other versions, and you unfortunately can't change into the Robo-Michael to blast everyone up. Otherwise, though, all the levels are in tact, and this plays almost identical to the Genesis version. Most interesting of all, MJ and co. have three drastically different games depending what medium you play it on. In the arcades, the game took an isometric viewpoint and played much more like your standard arcade beat'em up. There were multiple paths, kids were hidden in boxes you had to break, and you got to go all Altered Beast style with your monkey induced Robot upgrade. Weird. Upon bringing it home though, Sega simplified it to a straight-on, multi-tiered scrolling game for both the Genesis and the Master System. The Genesis version had the kids openly visible in the levels, and whenever he'd attack he'd use star dust to hit his victims. Dealing with pixie pixels was never the Master System's strong point, so instead of using stars to his his enemy, he simply kicks and punches. Still, graphically, it's not a bad trade-off at all. Also, in this version the kids are all hidden behind doors and other areas, which in a way makes this a more challenging improvement over all the games. Graphically, though, what you will notice most about this game is how startlingly similar it looks to 16-bit. This is a beautiful game. Previously, with other multi-platform ports like Altered Beast, Strider and Golden Axe, you really noticed you were playing a downgraded version on the Master System. Here though, with only a few superfluous flourishes removed, the game still looks and plays like a dream. No slowdown, no flicker, and some great character animation and level design. The game feels like it was natively made for the system and not just downgraded, and that's because it was. Sega took the time to reprogram the game for their lesser console, and it really paid off here. Graphically, this is a power house. Faulting the music comes down to taste. 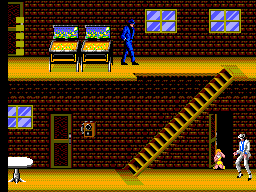 Each level in the game has its own Jackson tune, from "Beat It" to "Billie Jean". Personally, I love Jackson's old school tunes, and they really help keep the energy up throughout. My one gripe is that they opted to use "Another Part of Me" for Round 3 rather than the most notable omission, "Thriller". How can you have a Michael Jackson game without it? Hell, give me "Ben" over "Another Part of Me", please! Still, what tracks are included here make capable ports on the 8-bit sound chip. In the sound effects department, that's one area that was noticeably downgraded from the other versions of the game. In both the arcade and Genesis games, Michael had all his "Oohs!" and "Aahs! ", but here the man is largely at a loss for words. His little Katy's, too, are quiet, when in the other versions of the games they verbally thank you for their rescue. I don't imagine it would have made the memory used in the game skyrocket if they at the very least included one of Michael's yelps to add character, but they didn't, and that's the one glaring downgrade in the game. Button 1 attacks, button 2 jumps, and holding down the first button unleashes your useless magic dance. It's a tried and true layout, and it plays very well in this game. Directionally, Michael controls very responsive, and the game does a good job managing the multi-tiered levels with allowing Michael to easily drop levels by pressing down and jump. There's also a few added touches too, like the ability to moonwalk by holding attack and a left or right direction. It's useless, but looks cool, and hey, Michael was all about style! Collision detection is great, and manuevering Michael around levels and attacking baddies handles perfectly with the spot on control. Even the last two levels that take on a sort of first person shooter perspective handle just as they should. I always worry when two different gameplay modes are thrown into the same game, thinking one will stick out, but the end plays just like it was made by the guys who brought us Wolfenstein. It's a fun game, and the inclusion of the popular Jackson music in 8-bit will have you later wanting to revisit it just to hear some classic tunes. While the difficulty is mostly easy to average throughout, the last two levels are a real challenge and will definitely have you playing for ages. Thankfully there are unlimited continues, but seriously, the last level of shooting out space guns is so tough, that it'll make you want to Scream. Did you see that, I just did another Michael Jackson song reference. Awesome! Seriously though, without some coaching that last level will really mess you up. My strategy was to just focus on the gun in the right corner, staying as far right as I could until it was shot out. Since the homing missiles don't seem to hit you there, you can generally accomplish this without any hits. Once that's gone, it becomes a lot easier, since there's a much higher probability that the weapon you shoot at will be opened between the other three. Do that and you should be fine, otherwise you'll be at this all night! 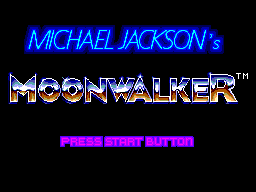 Michael Jackson's Moonwalker is a fun level climbing beat'em up that really stands out because of the star's personality. His tunes really give this game a nice flavor, and the fact that he's rescuing little girls is both a faux pas curiosity and a campy device that has made this into somewhat of a cult title today. Thankfully it's definitely worth playing besides these superficial qualities - Sega has done an amazing job with this port, making it no doubt the best home conversion of any of the later Sega arcade games. As one of the last Master System games released in the US, it's pretty tough to find, but well worth it. Be Smooth and get it, because being without this title in your collection is Criminal. Zing!